A game about dressing up a squirrel in a variety of crazy outfits. 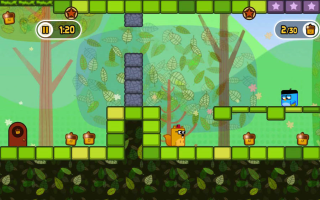 Oh yeah, there's also a polished, challenging, fun platformer starring a squirrel with a grappling hook. Blast through and play the levels to completion. Then try them again to get all the fruit and unlock the customisation. Then beat the speed run time.